"When the smoke clears, it just means he's reloading." 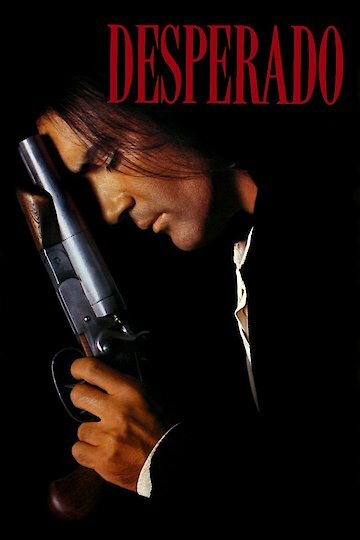 The 1995 thriller/action packed movie Desperado features Antonio Banderas, Steve Buscemi and Salma Hayek. Antonio Banderas will play a killer who in the original movie of El Mariachi had a lover killed by Bucho. Steve Buscemi will play a man whose name is never mentioned. He sits in a bar in Mexico where he tells of a story about a man who walks into a bar. This man walks into the bar with a guitar case full of weapons. He commits a massacre while looking for a man named Bucho. When this name is announced, the men sitting at the bar all of a sudden perk up. The bartender calls Bucho to warn him of this man. El Mariachi will come to town where he will come across a little boy who he befriends. When he enters into the bar where the story was being told, the men immediately notice the man. This causes the bar to enter into a frenzy. A gunfight will pursue where only one man walks out of the bar. He follows El Mariachi to see where he goes. In the process, El Mariachi will become wounded before he is able to kill the man. While attempting to locate Bucho he comes across a bookshop owner who takes him in and cares for his wounds. When he comes to and realizes that he has been injured, the bookshop catches on fire by Bucho’s men. This causes the bookshop owner and him to go on the run. The two of them are searching for Bucho where they come across him in a limo. El Mariachi will notice who the man is while trying to kill him. He has the opportunity to kill the man but does not. When asked why he does not, he offers no reply. The movie will go onto show that the man who is Bucho is actually the brother to El Mariachi. As the movie goes on, there are more and more gunfights. The action packed scenes are going to keep you on the edge of your seat. Desperado is currently available to watch and stream, download, buy on demand at Amazon Prime, Starz, Amazon, Vudu, Google Play, FandangoNow, iTunes, YouTube VOD online.